Since Wednesday, there’s a noticeable improvement. Marie is no longer delirious. However, she still has a fever. She’s still eating nothing but broth. She’s very weak and sleeps a lot. We hope that soon her convalescence will start. I’m waiting for it very impatiently. The wet nurse brought our little Thérèse today, who’s in good health and very strong. I thought I wouldn’t have time to write you. I’m taking advantage of a moment of rest. I hope to hear from you soon, and I’ll write to you again as soon as Marie is a little better. At the birth of St. Thérèse, her mother St. Zélie was unable to nurse the baby due to lifelong breast health problems. A wet nurse in the nearby farming village of Semallé had assisted Zélie in the past with feeding her babies. 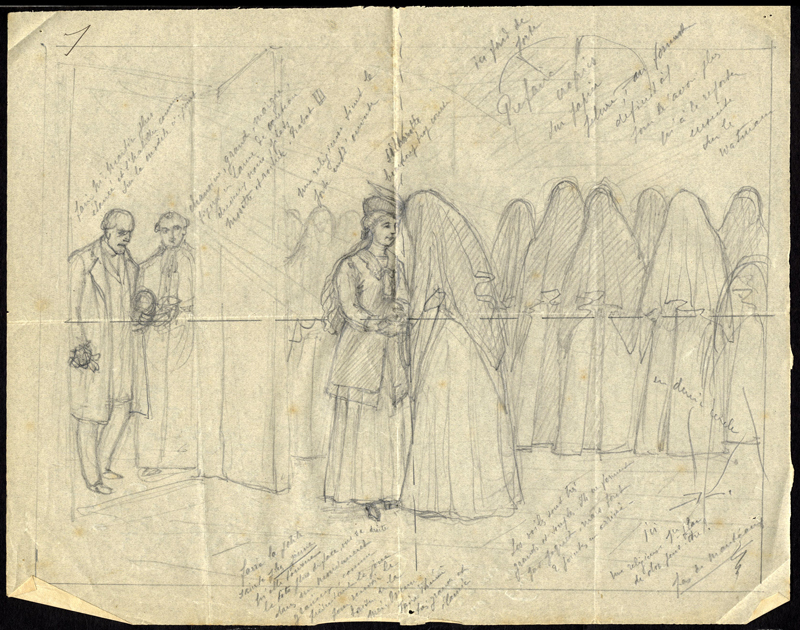 However, in January 1873 the wet nurse, Rose Taillé, had a newborn of her own and hesitated to make the trip from the farm to the town of Alençon. At the crack of dawn after Thérèse’s late-night birth, Zélie traveled to the farm and pleaded with Rose to come with her into town to feed Thérèse. Her persistence paid off: Rose Taillé, with her own baby in her arms, traveled to the Martin home with St. Zélie. After much drama — Rose solemnly pronounced that it was “too late” — Thérèse began to take nourishment. She spent roughly one year on the farm with Rose and her family in Semallé. Learn more about her difficult birth and infancy from Discalced Carmelite Father James Geoghegan here. See photos from and learn about a 2013 pilgrimage to Alençon here. View a video of the farmhouse with an English explanation here. Discover more about St. Therese from expert and speaker Maureen O’Riordan here. Explore the Archives of the Carmel of Lisieux here. Le Cantique de Céline is the 18th poem (PN18) in the collected works of St. Thérèse of Lisieux. Written 28 April 1895 at Céline’s request, St. Thérèse composed the poem for her sister’s birthday set to a melody that their father, St. Louis Martin, loved dearly. The patron saint of the missions is from your region. From Lisieux, Therese of the Child Jesus and the Holy Face has radiated her missionary ardor in the world. Her spiritual teaching, of a luminous simplicity, continues to touch the faithful of all conditions and all cultures. It is right that we should ask her to help the Catholics of France to follow her way of holiness and to develop their solidarity with their brothers in Europe, Africa, and other parts of the world to share the gifts received from Christ, our salvation. Your life will pass like an instant. On Carmel we are very near Heaven. My beloved, my love has chosen you. I have reserved a glorious throne for you!…. On 5 February 1895, Céline Martin was clothed in the Carmelite habit and began her novitiate in the Carmel of Lisieux. St. Thérèse wrote the Song of Gratitude of Jesus’s Fiancée as a gift for her sister’s clothing.